A beginner's guide to the definitive competitive shooter. 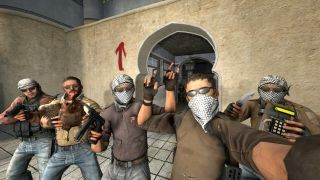 I started playing Counter-Strike: Global Offensive when it was in open beta. It was a scary time for a Counter-Strike nerd like me. I had played CS 1.6 (the version before Counter-Strike: Source and Global Offensive) since early 2005. In some ways it felt like the end times. My beloved game that had kept me sane through my years in school was slowly but surely dying. After a few months of complaining about the details that separated CS:GO from 1.6 (why would they have firebombs in a Counter-Strike game, I cried) a friend of mine suggested that we attend the upcoming Dreamhack Winter event in Jönköping, Sweden. I had never been to a LAN of that size before so I accepted and we put together a team consisting of friends from the 1.6 days, as well as a friend named John that had never played CS before. At all. If my memory serves me right it was about four months until the event when we started to practice. We had just learned that the bring your own computer tournament was going to serve as a qualifier for a main event that happened to be the first-ever CS:GO Major. After a few nights I must admit that I was ready to give up. John was terrible. A nice guy, but he just couldn’t play the game. Then something changed. After a couple of weeks I noticed that John had started to hit his shots, and that he understood the basics of teamplay and positioning. I went to his Steam profile and noticed that he averaged just under ten hours (!) per day. With a few days left we decided to meet up at a friend’s house closer to Jönköping to get some LAN hours under our belt before the tournament. We had so much fun, both in-game and out. It really felt like we were making progress each day. When we finally got to the venue and set up our computers I started to get nervous. Was this a mistake? I mean we’re pretty good, but not that good, right? We signed up for the tournament, went over the strategies in our playbook one last time and then later that same evening it was go time. Our first game was on the map Inferno. We won that game 16-0. Maybe we’d make it out of the groups after all? Fast forward to the next game. We were going to face a British team that had travelled all the way to Sweden for this event. Obviously, they meant business. This time the game was going to be played on Mirage, our strongest map at the time. In the first round we decided to go for a B-split. We took control over mid and then pressured their defenses from two sides. My teammates racked up a few quick kills and we found ourselves in a 5-versus-1 situation. I hid inside the kitchen and managed to remain unseen until the lone counter-terrorist had passed by me. A second later I had drawn my knife, secured the round and humiliated him at the same time. At that moment I felt like a superstar. I was on top of the world. However, that feeling wouldn’t last for long as that was the only round we won in that game. 1-16 was the final score and our dream was crushed. After yet another game we finished second to last in our group and our run in the tournament came to an abrupt end. That weekend we watched the Major, and when it was time for the grand final you could really feel the hype. The world’s best team NiP was going to play the underdogs, Fnatic. A few rounds into the game the crowd started to chant “Friberg! Friberg! Friberg!” after some great rounds from NiP’s Adam ‘friberg’ Friberg. At that moment I knew that this wasn’t the end times. This was the beginning. That’s part of the beauty of Counter-Strike: it never truly dies, even if it's come close at times. Then we got to see the biggest upset in the game’s short history up to that point, as Fnatic won the title. You might wonder why I told you that story about our somewhat naïve attempt to qualify for the first Major tournament. For me that’s the core of what CS:GO is: it’s competition at its purest. You don’t have any special abilities. No silly magic, no heat seeking missiles, no nothing. You have a basic arsenal of weapons at your disposal. Apart from that it’s just you and your teammates. Your objective is to plant a bomb at one of two bomb sites and make sure the counter-terrorists can’t defuse it before it goes off 40 seconds later. If you’re on the other side your objective is to prevent the terrorists from doing so. What truly makes Counter-Strike: Global Offensive unique is the economic system. It’s a round based game and in the first round you start with $800 and a basic pistol. That money is just enough for you to get body armor, some grenades or a better pistol. You have to choose wisely. If you win a round you get more money for the next one. At the same time you get bonus cash for consecutive losses. This system adds another layer of strategy to the game. Sometimes you’re better off not buying anything at all. Even if that means that you’re likely to lose that round it also means you have more money left for future rounds and that’ll increase your chances of winning a round and swing the momentum your way. The simple graphics and clean textures make players easy to spot. It’s not like in Battlefield where you can hide in a bush and kill people without getting seen. Because of how accurate the first few bullets are with most weapons, the connection between your hand movements and what happens on the screen is extreme. It’s a lot like a hockey player and his stick: easy to learn but takes a lifetime to master. Aside from your physical dexterity, CS:GO will push your mental capabilities to the test. The number of different strategies you can employ is so great that it’s probably close to infinite. I’d go so far as to say that CS:GO doesn’t have a skill ceiling. It’s always possible to get better. You need a Steam account and a copy of the game. There are no hidden fees. No DLCs you have to pay for. If you buy the game you gain access to all the content you need to play. There are however weapon skins that you can buy either from other players through the Steam market or by buying keys to open crates that you get from playing. These skins are entirely optional and you gain no advantage whatsoever by doing so. Apart from looking cool and a potential confidence boost if you’re the kind of person that enjoys wearing the fanciest clothes or driving flashy cars. You’ll also need time. Like I mentioned earlier, it’s easy to learn how to play CS:GO, but it’s impossible to fully master. If your goal is to improve you’ll have to put in a lot of work. Read guides, watch professionals play and above all else: practice a lot! If you on the other hand want to have fun and play a game every now and then all you need is a little over an hour to spare, and that’s really stretching it. Most games end way before the 60 minute mark. It’s also helpful if you’re friendly towards teammates and opponents: sadly, there are a lot of people who aren’t. Unless you’ve played competitive games online in the past you’re likely to encounter more obnoxious people in CS:GO than you’ve ever had the bad fortune to meet before. Luckily, you have the option to mute people. Finally I recommend you to get a headset with a microphone. Being able to hear footsteps around you is a big part of the game and being able to use voice chat to communicate enemy positions to your teammates is equally important. Twitch's CS:GO section is an amazing way to find your favorite players and watch them play the game. Try to learn from them. Why did they position themselves like that, in that situation? There are also an almost infinite number of useful videos on YouTube. Search for things like spray control, flashbangs and smokes. Learn from the more experienced players. Once you’ve picked up the basics you might want to watch pro matches. Not only will they help you improve faster but they’re also a great source of entertainment. Especially once you get to know the players and teams. Over at HLTV.org they have detailed schedules where you can find information on when teams are playing. They also provide links to the match streams. Check it out! Finally, I’d also like to recommend the range CS:GO guides I’ve written for PC Gamer over the last year. You’ll find some neat tricks to use on different maps, how to use grenades and even guides for how to play different roles on a team. All of these the guides can be found below.